Fred Rogers was a good neighbor, but Maxwell King helps us see the draw of Fred Rogers was so much more than "being nice." Wow, am I glad I picked up this book. 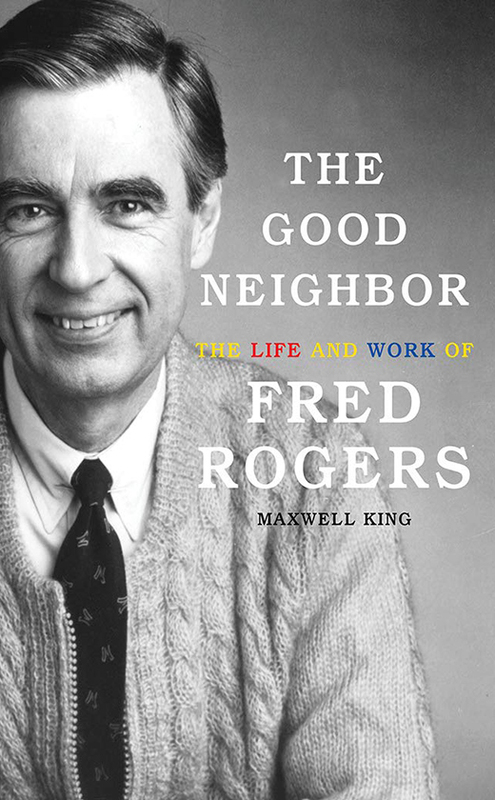 Maxwell King's The Good Neighbor: The Life and Work of Fred Rogers delivers on both the life and the work. He paints a beautiful picture of the early life and influences of Fred Rogers growing up in Latrobe, Pennsylvania. We need to see what he shows us to fully appreciate the immense success of Mr. Rogers Neighborhood. As to that great work, King carefully and brilliantly takes us on Fred's long road to success. We slow down to "Fred-time." We see Rogers' adherence to the highest standards, and his painstaking efforts to "get it right." We recognize Fred Rogers will not let the urgency of work impede his focus. We are with him as he intensively shapes each episode. Roger's friend, Wynton Marsalis summed up an essential lesson about the life and work of Fred Rogers when he said of the good neighbor, “Every original innovator doesn’t have to have psychedelic hair.” It was that contentment and humility to be himself that came across the television screen and enabled Fred Rogers to teach "multiple generations of American parents how very critical the first few years of human life could be, and how social and emotional learning is more important at that age than cognitive learning." p. 134. Read this book and you'll discover how Rogers world of puppets, piano, and passion for people shaped a generation and is still shaping lives today. 1. Parenting lessons: Reading The Good Neighbor was for me a parenting workshop, thanks to Maxwell King's careful work on the early years of Fred Rogers. King shows us the lasting impact of his parents and grandparents (Nana's promise), his neighborhood (riding the trolley), early life experiences (puppets), and education (Rollins College) to name a few. 2. History lessons: You will discover more about Benjamin Spock, the developmental psychologists Erik Erikson and Margaret McFarland and how their work shaped Rogers. 3. "Success" lessons: Fred Rogers' life is a testimony that the road to success is long and that it is paved with exacting standards of excellence, loving people, and humility. For instance, you will read about the time he stopped production, leaving highly-paid workers twiddling their thumbs, so he could consult an expert and “get it right.” If that's what it took that's what Fred Rogers did. 4. People lessons: Rogers iconic phrase, "I like you just the way you are" was more than a clever tag line. It embodied who he was and how he interacted with others. You see this, for instance, in his long friendship and working relationship François "Officer" Clemmons. 5. Faith lessons: Fred Rogers was a Presbyterian minister. Maxwell King shows us the influence of Jesus and Christianity had on Rogers and throughout his neighborhood. Rogers becomes an example of how faith in Christ shapes life and work.